Why is the OGC involved in Sensor Webs? There are hundreds of millions of Internet-connected sensors on, in and around the Earth, and the number is growing rapidly. Standardization is the key requirement for communicating information about sensors and sensor data and for comparing and combining information from different sensors. The OGC's Sensor Web Enablement (SWE) standards meet this requirement in the most complex as well as very simple applications. Sensor location is usually a key piece of sensor or sensor data information, and SWE standards make it easy to integrate this information into thousands of geospatial applications that implement the OGC's other standards. Planetary scientists first proposed the concept of standardized description files for sensor location in the early '90s. Subsequent work by NASA, the University of Alabama Huntsville and CEOS (Committee on Earth Observation Satellites) was brought into the OGC in 2001 for prototyping, testing and promotion as the OGC's Sensor Web Enablement (SWE) activity. The OGC, a geospatial standards organizations, took on the task of standardizing sensor communication because every sensor, whether in situ (such as a rain gauge) or remote (such as an Earth imaging device), has a location, and the location of a sensor is highly significant for many applications. The resulting suite of SWE standards – now being widely implemented around the world – enable developers to make all types of networked sensors, transducers and sensor data repositories discoverable, accessible and useable via the Web or other networks. OGC standards are downloadable at no charge, for use by anyone. Today, Internet-connected sensors are proliferating at a phenomenal rate. Smart phones typically include gyroscope, accelerometers, GPS, Wi-Fi, Bluetooth, cell, sound, light, magnetic force, time, near-field communications (NFC), compass, and camera. This list will soon include thermometer and gravimeter. Applications using combinations of these sensors are already providing capabilities for navigation in general, and soon, indoor positioning. Tiny, inexpensive, geolocated, network-connected sensors like these are rapidly making their way into vehicles, buildings, pipes, ducts, bridges, stores, and factories. The applications are endless, but the potential for positive "network effects" depends on open standards. The OGC, the world's leading location standards SDO, is participating in a multi-SDO effort to enable sensors to "plug and play" across the global information infrastructure. Geospatial technology traditionally includes GIS (geographic information systems), Earth imaging, location services, navigation, facilities management, Web mapping and spatial databases. Now, the ability to communicate sensor location and also other sensor parameters is a critical requirement in important emerging domains such as the Internet of Things (IoT), Machine-to-Machine (M2M) communication, optical imaging, Augmented Reality (AR), the smart grid, embedded mobile devices, location-based marketing and social networking. These developments often involve sensors and actuators that create new location information supply and demand and new demands for online geoprocessing services. This location information is derived from data provided by and about users, buildings, products, vehicles and physical infrastructure. To produce useful information, such data often needs to be "fused" with map data and/or computer-aided design (CAD) building data, and also text, image, video or sound. In this emerging world of ubiquitous computing, connectivity and digital sensors, inability to communicate spatial information and other sensor information stifles market development, frustrates users and prevents the rollout of technologies that address critical societal needs for safety, security and sustainable use of natural resources. 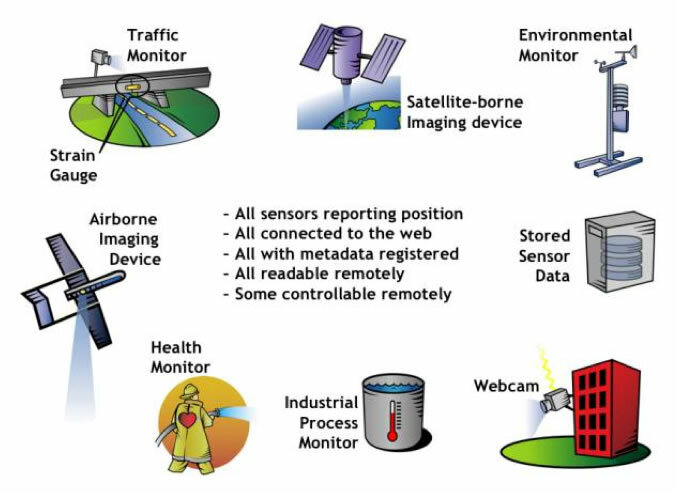 Current standards from the OGC can meet many of these emerging markets' interoperability requirements, but much work remains to make heterogeneous Web-resident sensors – and sensor data stores – useful to diverse applications that have been developed without knowledge of those sensor's descriptions. 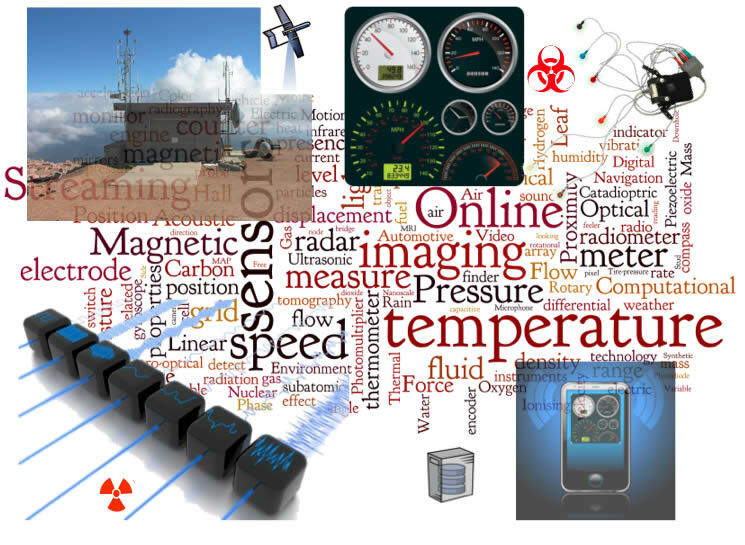 Integrating sensors involves semantic understanding of the sensors. OGC standards provide an important framework for addressing semantics, but more work needs to be done to enable fusion of data from diverse sensor types. Data quality and quality of service are important issues to address in sensor web standards development activities. Indoor location and indoor/outdoor location integration represent significant challenges for many sensor web applications, such as energy management and the smart grid. None of these challenges can be met without further standards work. No individual company or technology-biased industry association can meet these challenges. What is the OGC doing to meet these needs? In response, the OGC is attracting new members, promoting SWE standards in new market domains, inviting contributed specifications for possible adoption as OGC standards, and reaching out to other standards development organizations (SDOs). The challenges of ubiquitous computing and sensing require broader participation in SDOs by technology users and providers, and inter-SDO coordination on an unprecedented scale is necessary to avoid costly duplication of effort and unintended new standards stovepipes. OGC Technical Committee domain working groups focus on a range of application domains and crosscutting technology domains relevant to Sensor Webs. Most people assume it would be sufficient for most purposes if programmers simply had a standard way to encode simple latitude/longitude coordinates. OGC standards (including the SWE standards) provide this. The inherent complexity of sensors and of time, space and human activity in general, however, inevitably calls for more complex standards. Applications run into interoperability issues involving different geographic representation systems (raster, vector, postal, topological), graphical presentation styles, geospatial rights management, workflow, security, decision support, data quality (precision, provenance, uncertainty etc. ), data ordering, semantics, interoperability between computer models and many other issues. The domain working groups focus on these topics. The Sensor Web Enablement Domain Working Group focuses on SWE standards and SWE activities. Some OGC Domain Working Groups, in particular the Hydrology Domain Working Group and Meteorology & Oceanography Domain Working Group, address community-specific SWE issues, among other topics. In OGC domain working groups, members discuss requirements, standards and technologies; present and review commercial software solutions; and review compliance test procedures. They also discuss and organize the formation of OGC Innovation Program test beds, pilot projects and interoperability experiments. OGC Technical Committee Standards Working Groups are responsible for developing and maintaining OGC standards. OGC members, both technology providers and technology users, derive many benefits from working together to resolve interoperability issues. "Hooks" for PIDF/LO, IEEE 1451, TML, CAP, WS-N, ASAP, PUCK, etc. Sensor technology, computer technology and network technology are advancing together while demand grows for ways to connect information systems with the real world. Open standards are the key to connectivity, in sensor webs just as in the World Wide Web. Open standards open the door to new solutions for plant security, industrial controls, meteorology, geophysical survey, risk assessment, tracking, logistics, environmental monitoring, defense, logistics, location marketing, energy management, augmented reality and many other applications. Business needs drive the OGC standards process. Observations & Measurements (O&M) –The general models and XML encodings for observations and measurements. PUCK Protocol Standard – Defines a protocol to retrieve a SensorML description, sensor "driver" code, and other information from the device itself, thus enabling automatic sensor installation, configuration and operation. Sensor Model Language (SensorML) – Standard models and XML Schema for describing the processes within sensor and observation processing systems. Sensor Observation Service (SOS) – Open interface for a web service to obtain observations and sensor and platform descriptions from one or more sensors. Sensor Planning Service (SPS) – An open interface for a web service by which a client can 1) determine the feasibility of collecting data from one or more sensors or models and 2) submit collection requests. SWE Common Data Model – Defines low-level data models for exchanging sensor related data between nodes of the OGC® Sensor Web Enablement (SWE) framework. SWE Service Model ­– Defines data types for common use across OGC Sensor Web Enablement (SWE) services. Five of these packages define operation request and response types. The PubSub Standards Working Group is working to produce a version 1.0 implementation standard that clearly defines a standard way to enable publish/subscribe functionality for OGC Web Services. This will be applicable to sensors. Other specifications, often documented as OGC Discussion Papers or OGC Public Engineering Reports, are under discussion or in various stages of development on their way to potentially becoming adopted OGC standards. See also OGC Requests. The strategic agendas of OGC members drive progress toward interoperability and technology convergence. Different communities of practice and communities of interest have different needs and agendas, but often these communities’ needs and agendas overlap. Participating in OGC activities facilitates multi-community and cross-domain cooperation and cost sharing, and implementing OGC standards directly improves data sharing. OGC membership provides a cost-effective way for technology users and providers to influence and track the progress toward 21st century "ubiquitous computing" that connects to the real world. Visit the the OGC network SWE pages. See other materials on the OGC Press Coverage page.